Sources at the attorney Generals Department have disclosed to MyNewsGh.com that four recent charges are preferred against National Chairman of the opposition National Democratic Congress (NDC), Mr. Samuel Ofosu Ampofo and Deputy National Communications Officer, Kwaku Boahen. 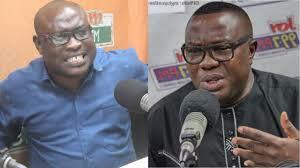 The two it is gathered are facing four charges; 3 for the National Chairman and one for the opposite and could be arraigned before court this week to answer the said charges in relation to the contents of the infamous Ofosu Ampofo tape. During his look before the Criminal Investigations Department (CID) last month, Mr. Ofosu Ampofo was charged with threat of damage, conspiracy to commit harm, disorder and assaulting a public officer and granted a bail in a total of GH?400,000 with 2 sureties. Kwaku Boahen, on the other hand, was charged with conspiracy to commit a crime to wit kidnapping and conspiracy to commit a crime to wit threat of harm but our sources reveal that the earlier charges have been withdrawn and new ones preferred against the 2 who appeared at the cid Headquarters on tuesday. Mr Amaliba discovered that at a point, they had to intervene and rescue their client from the claws of police interrogators whose conduct could be likened to complete harassment. “They played the tape and asked if that was his voice but he told them he does not respond to doctored tapes. They repeated the question but this point we had to come in and explain that our client had given his response and any attempt to tease answers from the same question meant harassment”, he revealed on an Accra-based radio station monitored by MyNewsGh.com.